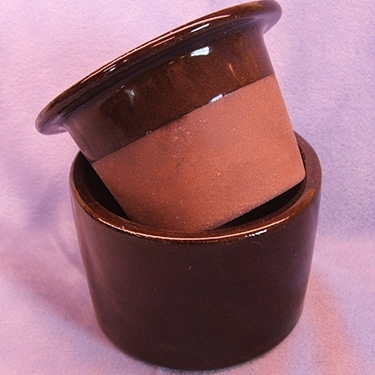 Unglazed inner pot inserted into glazed outer container that acts as a water reservoir. 2 3/8" inner diameter, suitable for mini and semimini violets and small plants. Seller's (our) of color, from what we have available. For best results you must use a soil containing at least 50% perlite--like our "wicking" mix. Assorted styles and colors. If you order with plants, ceramic items be shipped separately and will incur additional ($12) shipping costs! these are all I use for my African Violets they make taking care of your violet so simple and they are pretty as well! Highly recommend! I love these self watering mini pots. They make caring for your mini African Violets simple. After rescuing a struggling violet from a friend, I discovered self watering pots. Three years later my violet is still going strong and I have no worries about over or under watering. I have had the hardest time finding small self watering ceramic pots on the internet - these are fairly priced, and work perfectly! Had already ordered 9 little pots and wanted more but had to go to seller's choice. I am very pleased with the pots and with fast shipping and no damages. These self watering pots make beautiful violets easy!